If you have lost most or all of your teeth, you need a stable solution which can restore the proper form and function of your smile. In the past, the only option for replacing a full arch of teeth was dentures. However, traditional dentures often slip or slide out of place during normal daily activities, causing discomfort and embarrassment. Implant-supported dentures, in contrast, stay in place and allow you to eat, speak, and smile with confidence. At Watkins Family Dentistry in Elkhart, IN, we offer full-mouth implant dentistry with All-on-6 dental implants. By strategically placing six dental implants, Dr. Bruce Watkins can create a secure base for a full denture. 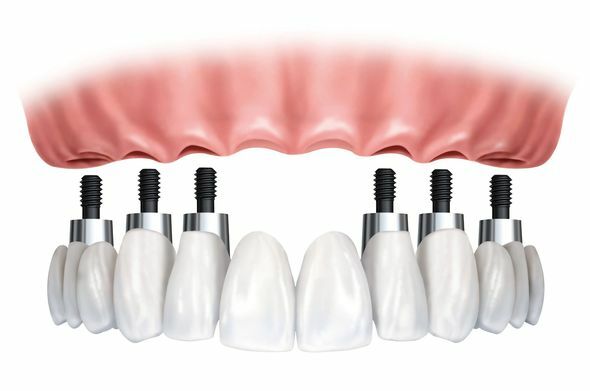 All-on-6 dental implants anchor a full denture to replace an entire arch of teeth with a minimal amount of surgery. Tooth loss is a common condition, especially in individuals over the age of 65. In fact, over 25 percent of seniors over age 65 have no remaining teeth. Losing most or all of your teeth affects more than the appearance of your smile. Widespread tooth loss makes it harder to eat and speak, as well as undermines your oral health. When you cannot chew properly, it is harder to consume foods with high nutritional value, such as whole fruit and vegetables. In addition, losing a tooth begins a process known as jawbone atrophy. Without tooth roots to stimulate the jawbone, the tissue begins to deteriorate. Left untreated, atrophy can lead to facial collapse, a condition which makes you look much older than you actually are. Replacing lost teeth with dental implants can improve your nutrition and halt the effects of jawbone atrophy for improved overall health. Conventional implant placement is vertical. In contrast, the All-on-6 method takes advantage of your remaining bone tissue by placing the back implants at an angle. Since the frontal area of the jaw has denser bone, this method can provide increased stability for patients who have lost bone tissue in the back of the jaw. The first step of replacing lost teeth with All-on-6 dental implants is a consultation with Dr. Watkins. During the appointment, we can use x-rays and our digital 3D cone beam CT scanner to take extensive scans of the teeth, jaw, and other supporting structures of your smile. Using this information, Dr. Watkins can select the optimal location for each of the six implant posts. Then, we can create a detailed surgical guide using our Moonray Digital Printer. Missing teeth can affect every aspect of your life, from your nutrition to your self-confidence. If you need to address widespread tooth loss, All-on-6 dental implants may be right for you. On the day of your implant procedure, we will provide anesthesia and sedation to ensure your comfort. Then, Dr. Watkins will make small incisions into your gum tissue and precisely place six titanium posts into your jaw. If you qualify for immediate placement, he can then attach a temporary denture to your implants. Typically, implants take about three to six months to fuse properly with the bone tissue. Once you have completely healed, Dr. Watkins can replace your temporary restoration with the final device for a fully restored smile. Missing teeth can affect every aspect of your life, from your nutrition to your self-confidence. If you need to address widespread tooth loss, All-on-6 dental implants may be right for you. For more information about the types of dental implant treatment we offer, contact our office online or call (574) 293-9832 to speak to a member of our team today.